21 Birth Affirmations to Use During Pregnancy and Delivery. Giving birth is considered as the greatest event in life by most women and rightly so. Many women consider their life incomplete if they don’t give birth to a child. As we know, the mind rules the body. Our present life is the product of our most frequent thoughts in the past. As the unborn child is fed physically and MENTALLY by the pregnant mother, her thoughts during pregnancy are of utmost importance for the child’s future. It is very easy to mould the child’s life if the mother generates and holds proper thoughts in her mind during the period of pregnancy. Not only that, the entire process of pregnancy and the event of giving birth also becomes pleasant and bother free if the mind, by way of thoughts, trains the body. The following birth affirmations cater to both-the period of pregnancy as well as the event of giving birth. It is advisable to select one or more affirmation/s that you feel suitable and repeat them the whole day whenever you find time. Your mind should be saturated with the affirmations. Only then will the thoughts be transferred to the cells of the body and consequently to the baby. I think it is the best gift that a mother can give to her child. I feel oh so pleasant. Every cell in my body is full of contentment and bliss. My pregnant body is beautiful. I radiate beauty and serenity. 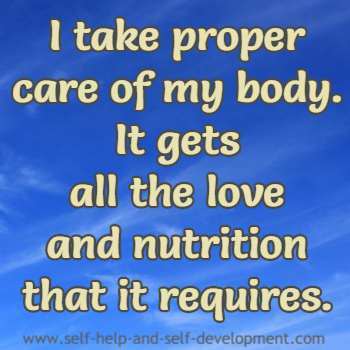 I take proper care of my body. 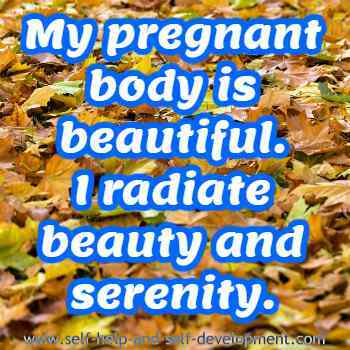 I am enjoying my pregnancy. I am in the best of my health. All my thoughts and actions are oriented toward my baby. I feel love toward everything and my baby feels my love. I exercise regularly and take proper food. 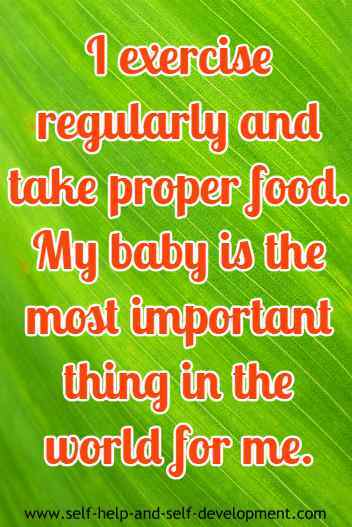 My baby is the most important thing in the world for me. 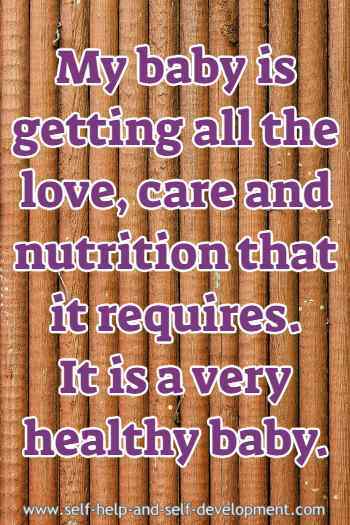 My baby is getting all the love, care and nutrition that it requires. It is a very healthy baby. A great future awaits my baby. It is going to love and enjoy its life. I am receiving love from all quarters. I share it with my baby. Every day in every way my baby is flowering and so am I.
I always breathe slowly and deeply. It helps my body and mind to relax. The delivery of my baby is smooth and easy. We both have enjoyed the birthing process. As I go into labor, my body and mind can easily handle the pain. The birth becomes more and more comfortable with every passing moment. My baby emerges with minimal straining and pushing on my part. It has had a smooth passage throughout. My baby is born at the right time. It is fully grown and healthy. I dissolve all tensions of childbirth. I am ready and prepared for the birth of my child. As my contractions start, I feel calmness and peace. I am ready to welcome my baby. I transcend all pain and give birth to a wonderful and healthy baby. 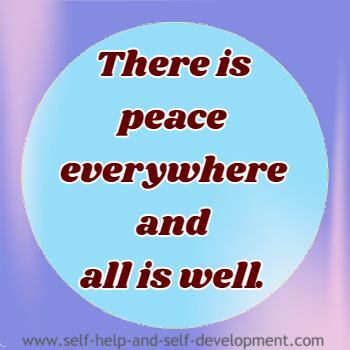 For affirmations to be effective and really change us from the inside, they have to be assimilated in the mind. It is best to repeat the affirmations for the whole day. If you have chosen only a few (one, two or three) affirmations, you can repeat each affirmation at least a thousand times daily. You can use a counter for the purpose. 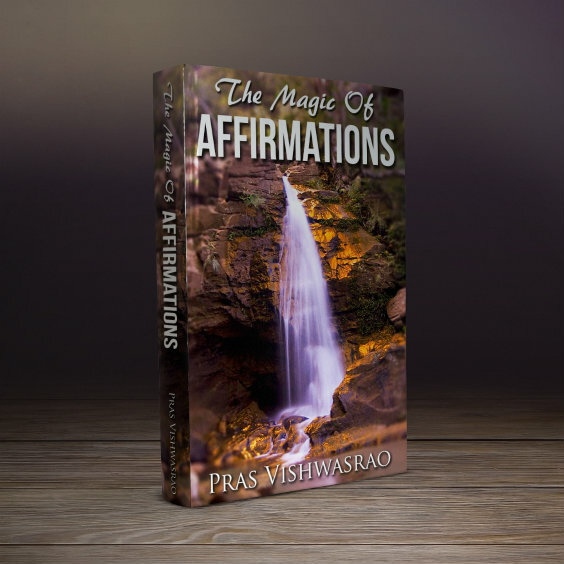 If you are using more affirmations, repeat each one at least a hundred to two hundred times. As for birth affirmations, you can start using them from the day you discover that you are pregnant. Happy Birthing !!! If you would like to listen to soothing meditation music when saying your affirmations, click here. 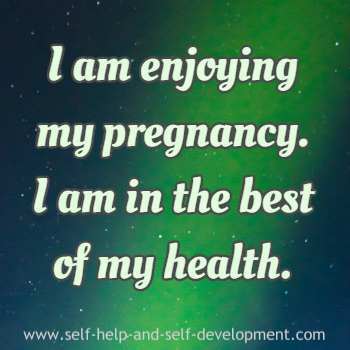 Another way of using birth affirmations is through hypnosis CDs or MP3 downloads. As you are aware, hypnosis is a powerful way of influencing the subconscious. If, in addition to affirmations, you also listen to hypnosis CDs or MP3s, once in the morning and once at night before sleeping, it will do wonders to your progress.